Inflatable Whitewater kayaks, known in Costa Rica as River Duckies, are the perfect next step for those who have experienced whitewater in a raft but are looking for their next challenge. The design of the Whitewater Duckies allows them to be much more maneuverable then a raft and easily powered by a single participant with a double sided kayak paddle. The Duckies also sit a lot closer to the water (and sometimes your actually sitting in the water) which allows each wave and river feature to feel a lot bigger then I may have in a raft. Our Duckies are big enough for two (have a guide join you or a family member for a lesson in team work) or can be easilypaddled by them selves. If you do end up flipping your ducky there is no special sequence of events, like there is in a hard shell whitewater kayak, to free yourself. This allows the whitewater ducky to be incredibly safe for all participants, experienced or not. For those who want to learn with their family a trip down the Pejivalle River is a great experience. The mellow river is still challenging but a great introduction to those with only a little bit of whitewater rafting experience. If there is just one or two in the family who are a bit more adventurous the River Duckies are easily added to a familywhitewater rafting trip. With a little experience most of the Pacuare River can also be run in a Ducky with just a few portages around the class IV rapids. No matter what river you decide to attempt we always start you off with a thorough safety talk for all this just in case scenarios. We will also show you the basic strokes necessary to successfully maneuver the boat around the rocks and through the whitewater. Finally we will make sure there is always a safety boater keeping an eye on your progress down the river. Even with a flip or two learning how to paddle a river ducky isn’t a bad thing. The water is warm and it will definitely make a great story later. 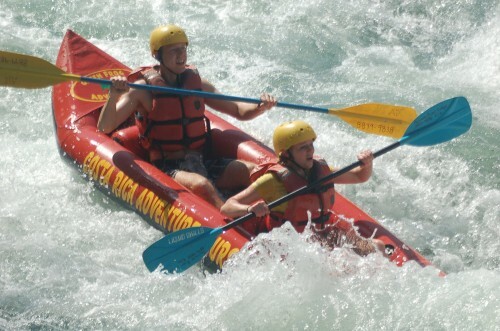 Contact us now and come join us on a river adventure in beautiful Costa Rica.